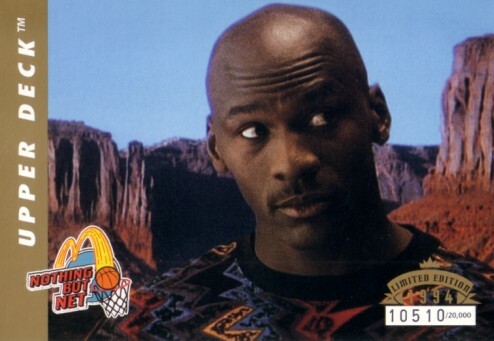 3 1/2 by 5 inch jumbo card issued by Upper Deck in 1994 in conjunction with the McDonald's Nothing But Net commercial campaign featuring Michael Jordan. Individually numbered 10510 out of 20000 on the front. NrMt-Mt or better. ONLY ONE AVAILABLE FOR SALE.